Florida 5th-graders prepare for the next big step. One hundred and sixty-two Osceola County, Florida students will enter middle school this fall much better prepared, thanks to their principal’s leadership, their teacher’s efforts, and a new book that addresses a difficult educational transition – the move to middle school. This spring, students at Reedy Creek Elementary School in Kissimmee, Florida used the book This Is Middle School to learn about the challenges they’ll face as they begin a new part of their educational careers. Reedy Creek principal Timi Godin, in her first year at the helm, spearheaded the effort. Principal Godin provided each student with a copy of This Is Middle School. The students studied chapters in small groups, and shared their discoveries with the rest of the class using posters and electronic presentations they produced. The boys and girls also shared their feelings about each chapter. Classroom teachers acted as “guides on the side,” providing focus and clarifying information as the students collected, analyzed, and interpreted the information. After the week-long book study, students were able to keep their books to share with their families. This Is Middle School features a 20-page section for parents. Principal Godin is already seeing positive results. Students told her that they’re “not as nervous” and “more ready” for middle school. A parent reported that their family is having conversations about success in middle school, and ways to support their son next school year. “That’s the idea. That’s what motivated me to write the book,” says author Keith Kyker, who taught middle school for 16 years. He also relied on his five-year experience as an elementary library media specialist. He’s seen both sides of the equation, and recognizes the profound difference between elementary school and middle school. Kyker also points-out more subtle differences. “Boys and girls who have been lifelong friends often see those friendships change. Extra-curricular opportunities create time-management challenges. 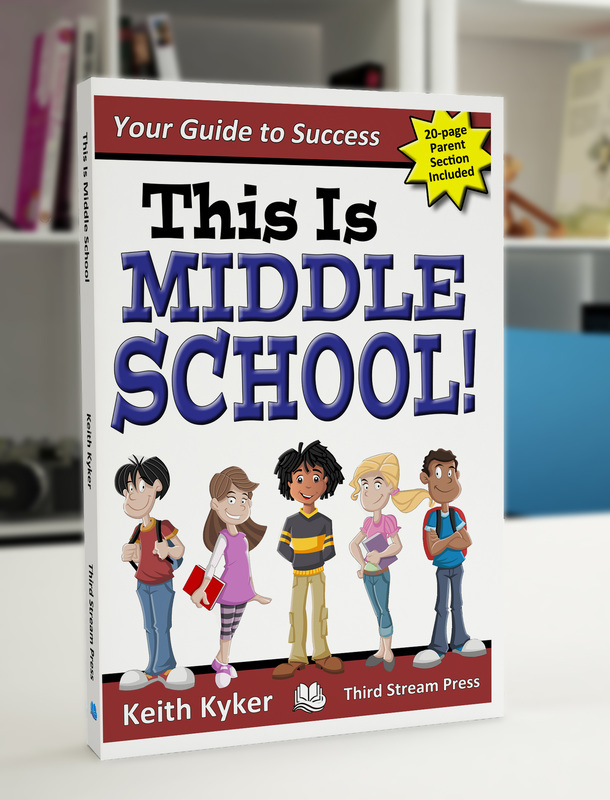 And middle school students need to adjust to several different classroom environments and teaching styles every day.” Kyker’s book has a chapter on each of these topics. How is your school using This Is Middle School? Send e-mail to keithkyker@yahoo.com to have your school featured on this web-site.